I assumed that when word of this "update" was released, that I would be able to skip a generation - yes, I'd miss out on the updates to Motion, Color, DVD Studio Pro, etc - but I am, at heart, an editor - and I usually rely on my friends who possess other skill sets to do the finishing work of grades and mixes. Skipping the generation is usually possible in Apple software - and if not, then they provide an upgrade path. Then Final Cut Pro X was released. It did not support FCP 7 projects. But, worse than that, Apple took the step of removing all trace of the earlier versions from their stores. They also asked their resellers to return all copies. So - what's a person in my situation to do? I asked Apple. Yes, that's an Xtranormal "if you can type, you can make movies..." video. I know, I'm going to hell. Nobody I spoke to (I also phoned business/ professional sales before speaking to Pro Apps support at Apple "Care) knows what has happened to all of the recalled boxes. The official line is to use the apple.com/feedback link (please note that in the version dropdown box for "Which version of Final Cut Pro are you using? ", the only option is 10.0) and hope that enough people do so in order for a solution to be worked on. That's http://www.apple.com/feedback/finalcutpro.html - fudge it in whatever way you can, I guess. 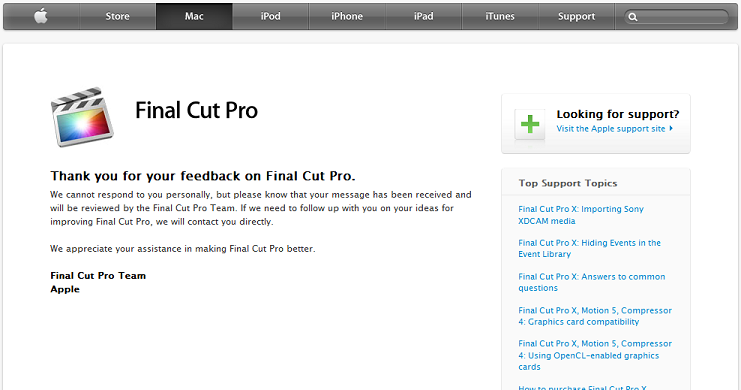 If you want a copy of Final Cut Studio 3, then the Apple representatives I spoke to recommend using Amazon Marketplace. Despite the recall. I mentioned to both people I spoke to that I currently have 3 orders with different retailers for an upgrade box - and that none of them seem to be able to source any stock to send me. They seemed surprised and unaware that it had run out this quickly. Apple, this has moved past a joke. It's now a tragedy. People won't forget within two weeks that you once had an editing programme which worked, even if you do pull it off the shelves and remove mention of it from your site. They may within two months or two years. And even if this brand new direction does take off eventually, they'll remember the hassle of this period - and not want to risk ending up in the same situation. I still have those three orders. Most have accepted the payment as their site showed the item to be in stock at time of order (or the site did not show anything) rendering , I cannot afford to spend upwards of what's now £300 on another potential wild goose chase before I get refunds when they admit they can't find it - and if they can, I need it. At least I need SOMETHING that can read Final Cut Pro projects. Which apparently isn't Final Cut Pro X.